*Please let us know if you will be needing a parking stall at least 2 days before you arrive. Parking spots cannot be guaranteed. Take the next right; you will then see a vertical brown sign that says Assiniboia Hall. Private parking will be on your left. 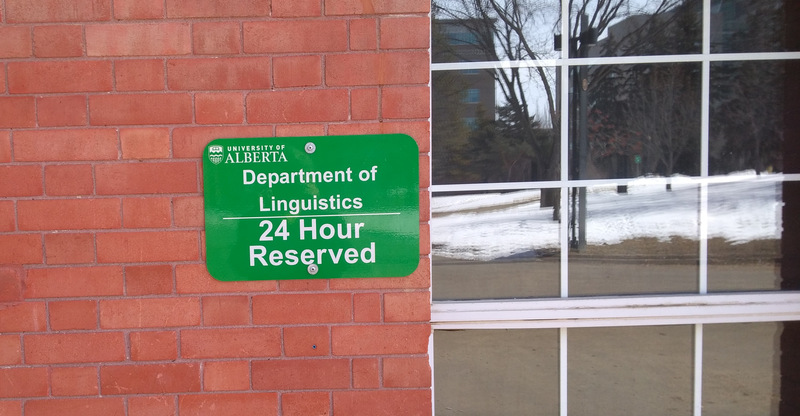 Please park in stall labeled “Department of Linguistics”. An image of parking stall sign is provided below for your convenience. Get off at University Station. Follow the signs that say “Dentistry/Pharmacy” to the top. Head towards the Students Union Building (SUB on map). Turn right once you reach SUB and follow the path. Look for the building with the Assiniboia Hall sign, it will be on your left. Enter the building and proceed to the 4th floor, room 4-02 where a researcher will be waiting for you. Get off at the University of Alberta transit station. This entry was posted in Uncategorized on June 1, 2016 by Benjamin Tucker.